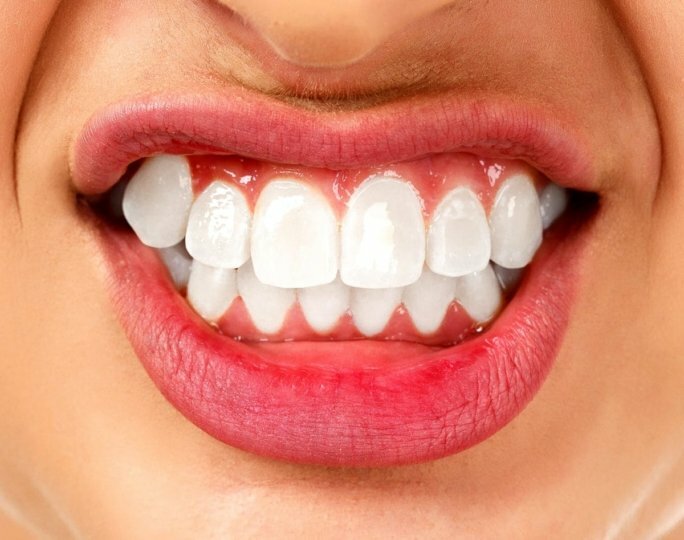 Teeth grinding, also called bruxism, is the conscious or unconscious grinding or clenching of teeth. It happens most often in children. About 20% to 30% of children grind their teeth, usually while asleep. You may have heard your child doing it at night. Sometimes, children will grind their teeth during the day when they feel anxious. The good news is, most children will eventually stop grinding their teeth. This often happens around the time they lose their baby teeth. Physical symptoms are usually related to the teeth and jaw. Teeth might look worn down or could be chipped. Grinding can wear down tooth enamel. So, the problem exposes children to future dental issues if left untreated. This could include sensitivity to hot and cold foods and drinks. Children who grind their teeth often say they have a sore jaw. This can happen when they wake up or when they are chewing. Teeth grinding can lead to headaches, earaches, and facial pain. Excessive grinding can cause TMJ, or temporomandibular joint problems. Some people grind their teeth and don’t have any symptoms. They may not even be aware that they are doing it, especially if they do it when sleeping. Sometimes they only way people know they grind their teeth is because family members hear them doing it while they are asleep. Doctors don’t always know what causes teeth grinding. Bruxism in children is more common in those diagnosed with a hyperactivity disorder or health issues, such as cerebral palsy. Certain medicines can also cause it. For some children, teeth grinding occurs because their teeth are not aligned properly. A physical exam can usually tell your doctor or dentist if you or your child have been grinding your teeth. Your doctor will notice the appearance of worn teeth and enamel. Medical professionals often consider teeth grinding as a diagnosis when a patient complains of any facial or oral pain, including soreness while chewing. An exam can also rule out other causes of your symptoms, such as ear infections. Can bruxism be prevented or avoided? Limit television and electronics several hours before bed. Provide calm music for them to listen to. Give them a warm shower or bath. Allow them to read or listen while you read. Reducing stress is important. Talk with your child regularly about his or her feelings. Help them deal with stress. If you are suffering from bruxism, take steps to reduce stress in your life. Talk to a friend, family member, or counselor about what is causing you stress. Try to eliminate stressors if you can. Treatment for bruxism can depend on your symptoms or the underlying cause. Some children who don’t have symptoms may not need treatment. Some treatment options are designed to reduce grinding and clenching. Your doctor may begin by having you or your child wear a mouth guard at night. The mouth guard is specially made to fit your teeth. It’s similar to mouth guards used by athletes participating in contact sports. There are many types of mouth guards. They are designed to work in different ways. Some are designed to prevent damage to your teeth. Others prevent the upper and lower teeth from touching to eliminate grinding. Your doctor will help find the right kind of mouth guard for you. If your grinding is caused by misaligned teeth, your doctor may recommend a visit to the dentist. Sometimes stress is the underlying cause of your or your child’s teeth grinding. In this case, getting to the root of emotional problems can often help. For example, your doctor may talk with your child about things that worry him or her. This could include school, home life, or new experiences. They can try to come up with a plan to help your child be less worried and anxious. If there is no sign of improvement, or the emotional problems seem to be more serious, talk to your doctor to explore further evaluation and treatment options. Apply wet heat or ice to sore jaw muscles. Massage the muscles in your neck, shoulders, and face. Avoid hard, dense, or chewy foods, such as nuts, bagels, or steak. Learn physical therapy stretching exercises. Relax your facial muscles throughout the day. If self-care steps don’t help after several weeks and you are still experiencing symptoms, call your family doctor. Does grinding your teeth run in the family? How can I keep the noise of my or my child’s teeth grinding from affecting the entire family? Will the damage to my child’s teeth affect his or her appetite? My child still has his or her baby teeth. Do I need to worry about damage to the teeth? Will you treat this problem or will I need to see a dentist? There are many causes for headaches, which are sometimes accompanied by other symptoms. Follow this chart for more information.